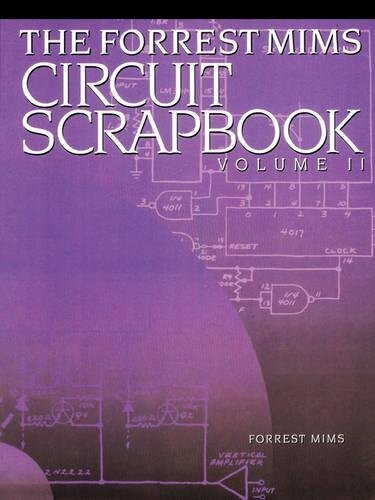 Here it is--a collection of Forrest Mims's classic work from the Modern Electronics magazine! Using commonly available components and remarkable ingenuity, Forrest shows you how to build and experiment with circuits like these: analog comparators; audio synthesizers; data loggers; fiber optic sensors; laser diode devices; MOSFET oscillators; piezoelectronics; power electronics; programmable function generators; pulse generators; radio control systems and much, much, more! Forrest Mims has been an electronics hobbyist since building a one tube radio kit at the age of 11. Following graduation from Texas A&M University in 1966 and service as a photo intelligence office in Vietnam, he worked for three years with high-powered lasers, solid-state instrumentation, and trained monkeys with the Air Force Weapons Laboratory in New Mexico. Since becoming a full-time writer in 1970, he's written several hundred magazine articles and scholarly papers. His articles and columns have appeared in virtually every significant electronics magazine, including Popular Electronics, Radio-Electronics, and Modern Electronics. His articles on other scientific topics have appeared in a wide range of other publications, including National Geographic World, Science Digest, Highlights for Children, and Scientific American. His editorial exploits have included an assignment from the National Enquirer to evaluate the feasibility of eavesdropping on Howard Hughes by laser (it was possible, but Forrest declined to take part) and getting dropped by Scientific American as their "The Amateur Scientist" columnist because he admitted to the magazine's editors that he was a born-again Christian. His book sales total in the millions, and he is likely the most widely-read electronics writer in the world.